Choose a music video and song and then bob your head along as it's superimposed on a professional dancer's body. 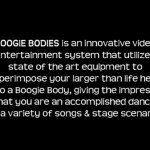 Boogie Body Dancing is the hottest interactive video sensation taking the entertainment industry by storm. It’s not lip-synching, it’s not karaoke, and no talent is required! All you need to do is choose a music video and then bob your head along with the beat of song. 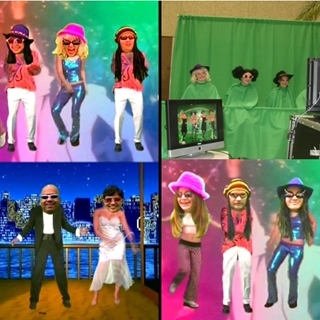 Using state-of-the-art “Green Screen” technology, guests’ heads are superimposed on professional dancers’ bodies as they sing along to some of the greatest pop hits of all time. A memorable DVD of the performance is given to each guest to take home.